The debt ceiling has now been officially increased to $14.3 trillion, up another $1.9 trillion, which will get us through the beginning of 2011 before it needs to be raised again. We now wait for the re-appointment confirmation of Bernanke which should be in just a few hours after the Senator vote. It's a fitting day for both to be announced as Bernanke will be purchasing the majority of the $1.9 trillion with his printing press. 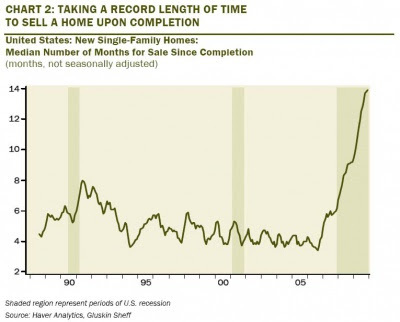 The following chart shows the current number of months needed to sell a new home upon completion at 13.9 months, an all time record and 50% higher than last year. Let's hope that cost to build a new home does not go under the cost to purchase a foreclosure across the street. 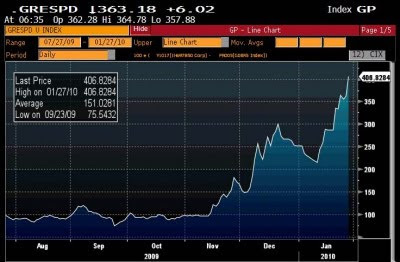 New all time highs on the cost to insure Greek debt. It is a daily event now. While people feel that Obama's job stimulus announcement last night is important, I assure you this is the most crucial event happening in the world right now. 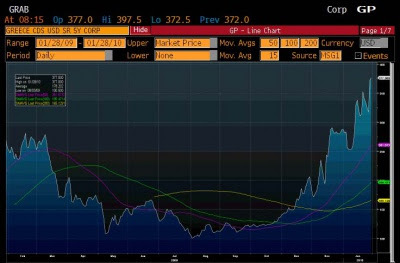 As speculators pounce on the Greek debt it is eerily similar to watching Lehman get beaten to a pulp on their way to bankruptcy. 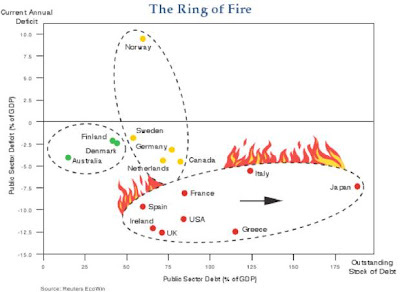 Bill Gross, adding to his ring of fire article this week, told the Guardian that "the UK is a must to avoid. Its gilts are resting on a bed of nitroglycerine." High debt with the potential to devalue its currency present high risk for bond investors." His continued pressure on government debt should add strain to the already unstable environment. This afternoon the SEC voted to allow Money Markets the ability to suspend redemptions. This is MASSIVE news for the market. Money Markets are funds that invest in "cash" equivalent funds such as treasury bonds, AAA corporate bonds (Walgreens/Microsoft), or municipal bonds. (State government debt. The goal is to allow investors to receive higher interest than they would at a bank deposit, and the funds are sold as essentially cash that is "risk free." During the panic in the fall of 2008, one of the money markets "broke the buck" meaning that it would be returning less than 100% on the dollar to investors. The reason for this is because treasury bonds, AAA corporate bonds, and municipal bonds are not cash; they actually have "risk" of loss. After that specific fund cracked there was a run on all money markets and the Fed had to step in and guarantee 100% on the dollar for every money market in the country. In order to prevent this from occurring again the SEC has now given money markets the ability to suspend redemptions. This means if a money market gets in trouble and you ask to have your money back, the money market can tell you "NO." You will not be able to get your money until they decide to allow redemptions again. After this announcement today, treasury bills (3 month or less government bonds) went negative at -.1%. Buying a treasury bill means you lend the government X amount of dollars for three months (or less) and at the end of that term they give you that money back. Investors are now paying the government to hold their money due to their fear of money markets. Look for this trend to continue as all debt continues to deteriorate. The actual proposal voted into effect today can be found here. The cost to insure Greek debt hit a new record high today. We are just waiting now for the last ratings agency to downgrade the debt before we begin the global debt explosion. It appears the home buyer stimulus euphoria is beginning to wear off. Perhaps buyers have figured out that an $8,000 home buyer credit helps sellers, not buyers. As soon as the credit goes away the home prices will fall by that amount, leaving the buyers stuck with their very own underwater mortgage. Bill Gross, who manages the largest bond fund in the world at over $1 trillion, put together a chart that shows the countries who are headed for enormous problems with their debt. The chart shows actual public debt (the amount of money the public owes) and government deficit debt. The combination of the two will create a lethal combination as we move forward. Most of the names you see in the ring of fire I discussed in The Perception Of Safety. The Case Shiller home price numbers were released this morning. The numbers are on a three month lag, and this morning we received the information for November. Home prices fell month over month, down .2% overall. This marks a turning point for the consecutive months of price increases we have seen since last spring. You can see pricing for individual cities here. Yesterday we received existing home sales for the month of December which were down 16.9% month over month, the biggest drop ever. That will most likely have an impact on the home price data we receive next month for December prices. Once Bernanke is reaffirmed, it will probably not be too long before we hear about a new home program and his announcement of new mortgage purchases. The market is now falling with the Fed and the government purchasing all new mortgages, imagine what would happen if they actually stopped? Or even worse, what if the ocean of shadow inventory came off the banks books and on to the market in foreclosure? Could be trouble as we enter the second wave of mortgage resets over the next three years with the option arm mortgages. Remember, these resets are even larger in size than subprime. The Financial Times reported yesterday that the FDIC is working on plans to sell off some of the toxic real estate that they have acquired over the past two years. The FDIC is the government institution put in place to take over a failed bank. They also guarantee the deposits up to $250,000. They plan to package the assets and sell them into the market. This was the same tactic used by the government during the savings and loan crisis back in the early 1990's. During that period it was called the Resolution Trust Corporation. I applaud the move as it is a real step needed to cleanse the market. During the S & L crisis real estate was sold by the government at pennies on the dollar and it was the time real investors entered the market to purchase the real estate. The government is now able to pursue this strategy again because all of the big banks have been nationalized. They also have changed their accounting rules so they do not have to report actual losses. The losses moving forward will be faced exclusively by the taxpayers. However, this means we are getting closer to the point where it will be time to purchase real estate. If the strategy is put into place anyone still holding real estate will be decimated as the FDIC sales will become the new prices for property. They will create a true market. Its pretty much raining everywhere right now so I thought it would be a good time for a fireside talk about what is happening in the financial world as we wait for the football games to start this afternoon. The big news of the week, no question about it, was the Massachuessetts Senate election. The state has essentially had democratic leadership since the dawn of mankind. When a replacement was needed for Kennedy, it was immediately assumed that the next in line democratic candidate would just show up and take over the post. However, something fascinating began to happen over the past few weeks. An unknown contender, Scott Brown, began to run his campaign based on his ability to vote down Obama's spending bills of mass destruction and on Tuesday night he shocked the world by winning the seat. His victory takes away the needed 60 votes the democrats had to vote through any bill they wanted. It slammed the breaks on Obamacare, as well as his other never ending spending a-bombs. Tuesday night was a moment when I had a brief feeling of hope for our country. Not because I feel Republicans are any better than Democrats, but because it appears the people of the nation are very slowly starting to wake up to what is being done to them. How does this all effect the markets? 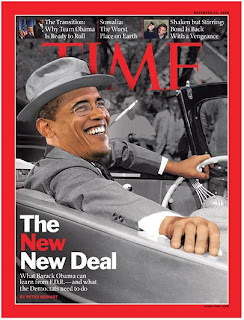 The next day Obama out of nowhere called a press conference and declared war on the banking sector, the "bad guys." The press conference was like watching a 12 year old girl emotionally throw a temper tantrum after being told she can't have something. Without even understanding what prop trading means, he told the world that he plans to do everything in his power to shut down proprietary trading at the offices of these reckless gamblers. The markets, looking on with horror, began to sell off hard on Wednesday, Thursday, and Friday, understanding that our leadership is a rolling, reckless, loose cannon that is waiting to deploy on the next part of our ship. Someone forgot to tell Obama that the proprietary trading was the current major source of revenue for the reckless gamblers that he nationalized last fall. Estimates show that proprietary trading was 45% of the revenue source for Bank of America during 2009. What is prop trading? It means using your own firm's capital to trade, different from a hedge fund who uses client's capital to trade. Since they can no longer sell mortgages, put together merges and aquisitions, or launch IPO's, prop trading (gambling with the tax payer's money) was one of the few sources of revenue remaining. In reality, Obama will do nothing of the sort. This was just populist chatter that will ultimately have no teeth. What does have teeth is Obama's promise this week to re-direct focus on job growth. His most recent $154 billion jobs bill two months ago was just the down payment for what is likely coming. As the jobs indicators across the board appear ready to turn down again, look for a massive spending bill to come from Washington to "create" jobs for the country. By "create" of course I mean "destroy." The government has no money; they tax an efficient part of the economy to create inefficient government jobs. The sum is a net loss to the nation. What will be interesting will be to see how large the job destruction bill will end up being. It's total will add to the current $1.7 trillion deficit projection this year. 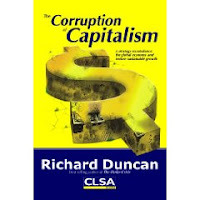 I've spent the weekend reading Richard Duncan's "The Corruption of Capitalism," which is one of the best books I've read in a long time. The book is divided in three sections: The Present, The Past, and The Future, taking you full circle through the current economic environment and providing answers to how to solve the problems. The best online reading this weekend came from Zero Hedge who provided an in depth look at treasury purchases this year. I will try to summarize the article in the future using easier terms, but until then it is a masterpiece worth reading. Another article on a similar note came from the New York Post regarding our debt burden.